1919 — Jamestown organized as Club #507 sponsored by the Buffalo Club. 1919-1920 — Founded Moon Brook Country Club, Sponsored Warren Rotary Club. 1920-1921 — Organized Community Chest. 1920-1921 — Played Santa Claus to Randolph Children's Home. 1922-1923 — Rotary Community Field Day at Celoron to benefit crippled children raised $3,500. 1925-1926 — Sponsored Salamanca Rotary Club. Built cabin at Cassadga Health Camp. 1927-1928 — Built cabin at Boy Scout Camp, Tom's Point, Hosted District — Conference. 1928-1929 — Sponsored Westfield Rotary Club. 1931-1932 — Organized Jamestown Boy Scout Council. 1932-1933 — Hosted District Conference. 1935-1936 — Sponsored Dunkirk Rotary Club. 1936-1937 — Built swimming pool at Children's Health Center, Allegheny State Park. 1937-1938 — Established Jamestown Boy's Club. 1938-1939 — Chautauqua Amphitheater Rotary Day, speaker International President Maurice Duperrey of France. Sponsored Falconer Rotary Club. 1939-1940 — Won third place out of 5,280 Clubs for community service. 1940-1941 — Daniel F. Lincoln elected District Governor at Havanna Cuba Conference. Dedicated Henry H. Roberts Cabin at Camp Mertz. 100 percent attendance meeting Dec. 9, 1940. 1941-1942 — First Golf Tournament, Fred J. Galloway Trophy. Rotary International President Walter Head at Chautauqua Rotary Day. 1942-1943 — Sponsored Breakfast Club, Don McNeil Show at stadium. 6,000 attended. Profit $2,500. Junior Rotarian program started. Three hundred boxes sent to servicemen. 1943-1944 — Phillip Lovejoy International Rotary Secretary spoke at our 25th Anniversary Party. War Bond Sale sold $17,000. Rural Urban Day started. 1944-1945 — Won the Governor's Award for the best club in district (service). Clothing drive for London bomb victims. 1945-1946 — Brig. General Carlos P. Romulo spoke at Jamestown High School. Sponsored 4-H Chicken Project. 1946-1947 — Rotary International President T.A. Warren (England) was at Chautauqua Rotary Day. Incoming RI president Richard Hedke was at our meeting. 1947-1948 — Donated $1000 towards building project at the Boy's Club. Rotarily Yours judged best in the district. 1948-1949 — $1,500 donation for Rotary Library at new Girls Club building. Sent exchange teacher to England for one year. 1949-1950 — Dedicated 40x80 picnic pavillion at 100 acre lot. 1950-1951 — Third Rotary Auction, 2,000 attended. Profit $1,000. 1951-1952 — District Conference held at Hotel Jamestown, attendance contest with Kitchner Club Waterloo Club. 1952-1953 — Dedicated Infirmary at Camp Mertz. 1953-1954 — Rotary Club wins contest for bringing in 663 members in the Chautauqua Lake Assn. drive. 1954-1955 — Built Infirmary at Girl Scouts Camp NEWATAH. 1955-1956 — Built the first green at the Municipal Golf Course. Sent 4,000 lbs. of clothing to Navaho Indians. 1956-1957 — Chautauqua Music scholarships initiated. Sponsored Bennet Cerf at Jamestown High School. 1957-1958 — Sponsored Julius LaRosa Show at Jamestown High School, profit $3,000. 1958-1959 — Started Travelog Series. Funded snack bar at Jamestown General Hospital. 1959-1960 — Donated Flashight Candles to JHS A Cappella Chorus. 1960-1961 — Donated equipment to Senior Citizens Center. Sponsored Little League Team. 1961-1962 — $3,600 worth of equipment for new teenage center at YWCA. 1962-1963 — Donated $6,000 to Young Adult Section at James Prendergast library. 1963-1964 — Donated $1500 Movie Projector to JHS. Donated $1,750 towards equipment for Nursing Program at Jamestown Community College. 1964-1965 — Donated $1,250 for Red Cross Boat, motor and trailer. 1965-1966 — Donated $2,000 for Library Equipment at Fenton Historical Center. Hosted District Golf Tournament. 1966-1967 — First summer student, Elizabeth Scholten, arrives from Holland. Membership @ 180, an all-time high. Motorboat donated to YMCA. 1967-1968 — Donated $4,500 for Physio-therapy Unit at JGH. Donated $35,000 Phonographic Listening Unit for children's section at the James Prendergast Library. 1968-1969 — First full year foreign exchange student, Gustav Fernstrom, from Sweden. 1969-1970 — Donated Bronze Fountain "portage" at new city hall. English group study team here for one week. 1970-1971 — Five foreign exchange students coming in and out. 1971-1972 — Dedication of "Portage Sculpture" at City Hall. 1972-1973 — Sponsored Lakewood Rotary Club. 1973-1974 — Donated $2,000 for WCA inpatient admissions office. 1974-1975 — Rotary Amphitheater at the Audubon Center. 1975-1976 — City Ice Rink dedicated. Harold Griffith, Gordon Black, Russ Diethrick co-chairs. 1976-1977 — Roger Tory Peterson dedicates Nature Study Building a meetingin the Rotary Amphitheater. 1977-1978 — $5,000 dedicated to Rotary Baseball Field, Chadakoin Park. 1978-1979 — Additional $3,000 donated towards rotary Baseball Field. Donated $1,500 towards Rotary International 75th Anniversary Health, Hunger and Humanity Program. 1979-1980 — Donated final $2,400 to complete Rotary Baseball Field. Hosted Group Study Exchange Team from France. Assisted JHS A Cappella Choir for trip to England. 1980-1981 — First students sent to RYLA, Travelogue $9,400 profit. "I Love Chautauqua" game started as joint project with the Optimist Club. 1981-1982 — "I love Chautauqua" game nets $20,000. Assisted JHS Band as New York's entry in National Band competition in Florida. Received Rotary Foundation District Award ($700). 1982-1983 — Jamestown selected "Outstanding Club" in district 709 $5,700 in Community Service grants given to 18 Organizations. Six Paul Harris Fellows initiated. Jamestown wins team low net at district golf tournament. 1983-1984 — Student sent to RYLA seminar. Commenced "Potato Project" with 4-H members. Hosted district 709 golf tournament. Honored three 50 year Rotary members. Completed "I Love Chautauqua" game project, $28,000 profit. 1984-1985 — Two students sent to RYLA, Hosted & sent out four exchange students. Two students participated in summer exchange program. Contributed $5,000 to the Rotary Foundation. Contributed $1,000 to the Boy's Club Building Fund. 1985-1986 — Sent two students to RYLA, hosted 3 & sent out 3 exchange students. Two students participated in summer exchange program Benefit auction raised $6,000 for the Handicap Camp. Initiated plans for handicap camp and Air Show. 1986-1987 — Committed $15,000 over three years to the Palace Civic Center. Held first Air Show, Auction raised $10,000 for Handicap Camp. 1987-1988 — 100% of members pledged $55,414 of their oun funds to the Polio Plus Rotary Drive Auction raised $16000+ for handicap camp. 1988-1989 — Community service donations tripled those of previous years. Record breaking $22,000+ raised from Benifit Auction for Handicap Camp. Campers up from 33 to 53. 1989-1990 — James H. Riggs elected District Goivernor at Seoul Korea Convention. Hosted a very well receive District 709 Conference. Membership campaign yielded 10% growth, including female and more youthful members. A central office was opened with a paid office manager. Benifit Auction again raised over $20,000. 1990-1991 — Membership up from 139 to 159. 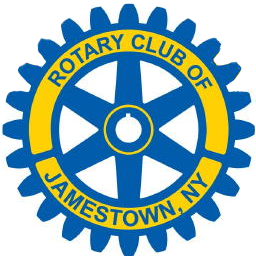 Sponsored the Greater Jamestown AM Rotary Club. First Annual Farch Celebration (thanks Jim Abdella). First Annual Scholarship awarded. Ten new Paul Harris fellows (greatest one year total).